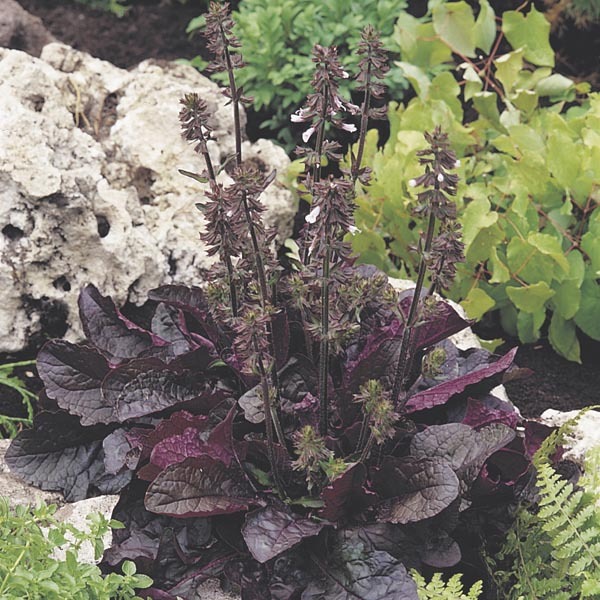 Unlike most of its Salvia relatives with dull, hairy foliage, the leaves of the lyrata species are glossy and a bit textured. Popular, named varieties have the added attraction a red to burgundy coloration to the leaves. All have upright spikes of dainty blooms. Wonderful for mixed borders and rock gardens. Perfect for all kinds of containers. Cut flowers are long-lasting in fresh bouquets. Plant in drifts or bands for best effect. Does best in light, well-drained soil. Allow soil to dry between thorough waterings. Remove faded flowers for best display. Protect from excessive winter moisture.